I'm not going to lie, the thought of feeding sweet pea solid foods terrified me. For one, I didn't want to admit that she was old enough to be eating grown up food. That happened WAY too fast! It also overwhelmed me because I know how hard it is to find healthy, nutritious foods. I try to cook healthy meals around here, but I still didn't feel like what we eat was good enough for her. And I definitely didn't feel like the pre-made baby meals from the store were going to cut it. 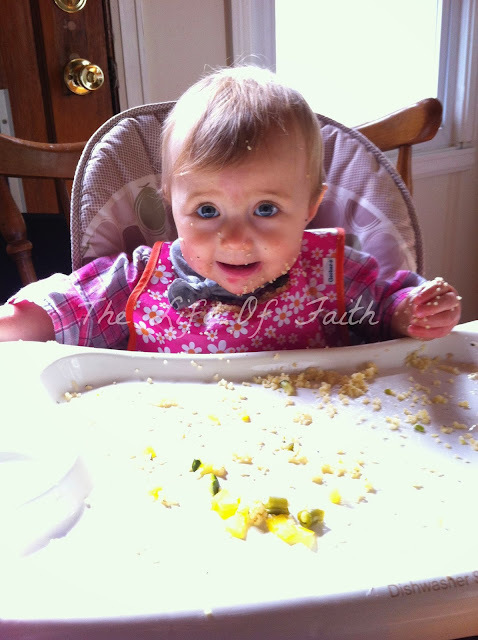 For those of you mamas who are in a panic wondering, what do I feed my baby? Here's a place for you to gather ideas to get started! (Note that sweet pea still gets most of her nutrition from breast feeding and also still needs softer foods because she only has 4 teeth). I don't claim to have it down pat...I still sometimes panic as mealtime approaches trying to think of what I can feed her. Somehow we've made it this far and she hasn't missed a meal yet! She likes to feed herself so I give her mainly finger foods with the occasional baby food puree. Every once in a while, I get fancy and make her a smoothie with berries, banana, orange juice and spinach (sshh she doesn't know about the spinach ;) As you can imagine, smoothie days are her favorite hands down...or up! I like to add spices like cinnamon, cumin, garlic, basil, etc to add flavor. This stuff is AMAZING! It's almost the same as those flavored baby puffs that come in the little containers. Walmart has these puffs in the cereal isle for $1 a bag! Yes, I am singing and doing a happy dance. Don't judge. But seriously, it doesn't get any better than this for a healthy whole grain baby snack! For dinner, I try to cook meals for all of us that sweet pea can eat all or part of. If there is something that is unhealthy about our meal, I just vary it for sweet pea. And if our dinner is so unhealthy (gulp) that I don't want her to have any, I just give her some steamed veggies, a serving of whole grain and beans, chicken or fish for protein topped off with a little fruit for dessert! And my baby is so awesome, she cleans up after herself...check this out! There's our mealtimes in a nutshell...or a blog post I guess. If you have any questions, comments, need recipes, or anything else, feel free to comment below or even send me a private e-mail. Love some of the things you are giving her! I will have to start trying some of those things with my little one. 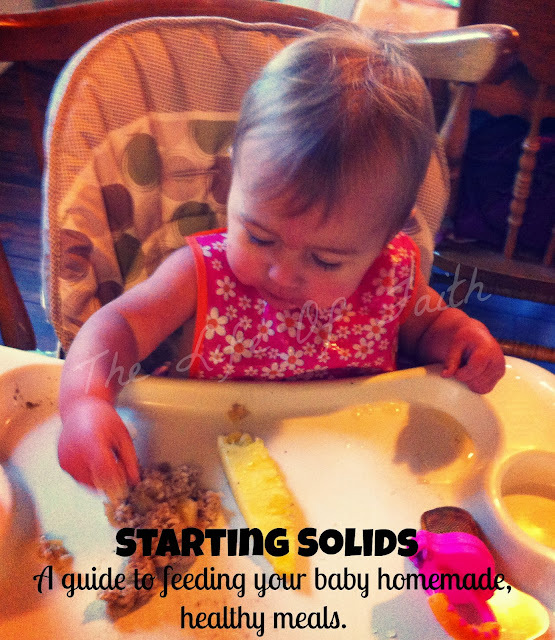 I just wrote about solids too, but I just love your little menu! 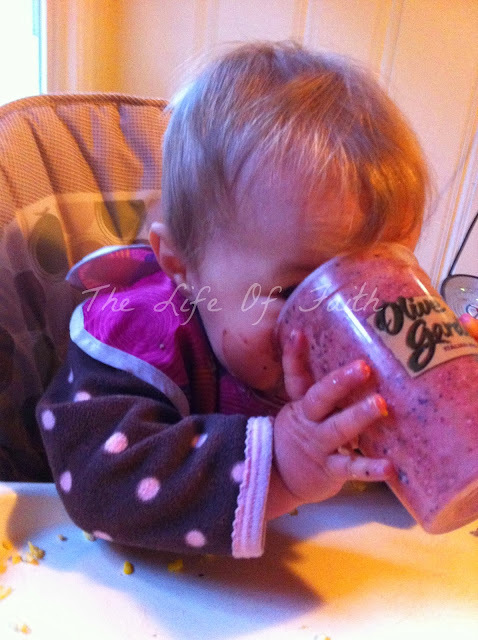 You are such a brave Mama to do smoothies! What a mess. 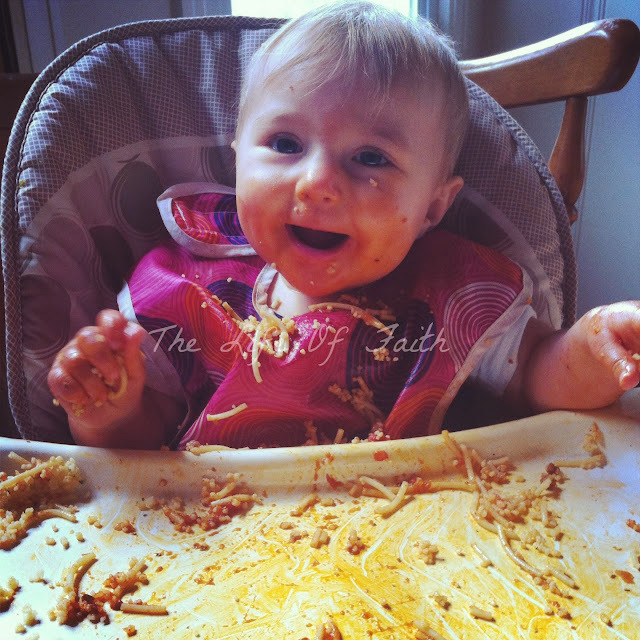 :) Feeding a baby is totally overwhelming. We cook Myra such healthy foods, but she refuses to eat any veggies. It is SO frustrating. She was great about eating them when she was a baby, but toddlerhood as made her stop. P.S. I LOVE the pics! So cute! Wow - what a healthy baby she is! That's so amazing!!! When it's time for me to have kiddos, I hope they eat as healthy as yours! That is so cute how she cleans up! My little one wipes her own mouth. It's funny what they pick up from us at such an early age. Nothing beats Kaleigh pretending to eat chips though, that was the funniest thing I've ever seen!! We didn't use very many baby purées with our girls either and their under 1 diet was similar to yours. I wasn't as worried about the what but was very overwhelmed by trying to figure out how much to feed. I love that you included quantities to give parents an idea of at least where to start! Great info!